Italy’s new anti-establishment government took power on Friday, ending months of deadlock that saw the eurozone’s third largest economy narrowly avoid snap elections after a last-gasp coalition deal. New Prime Minister Giuseppe Conte, 53, was sworn in at the head of the first populist government in an EU founding member that was forged by the Five Star Movement and the far-right League. “The new right is in power,” declared left-leaning daily La Repubblica. The transfer of power follows an inconclusive election in March and months of political turmoil which had spooked global financial markets and spread unease among Italy’s EU partners. Reaction to the new government was mixed, with concerns still running high about Italy’s massive debt and the future of the EU and its single currency. The coalition — which faces a parliamentary confidence motion early next week that it is set to win — plans to boost public spending and wants to renegotiate EU treaties and review the bloc’s economic governance. Its proposals — which include a monthly basic income for Italy’s poorest and a two-tier “flat” tax — have worried Brussels and the financial markets given Italy’s massive 2.3 trillion euro ($2.7 trillion) debt. European powerhouse Germany vowed an “open” approach to Conte’s team, and Chancellor Angela Merkel wished Conte “good luck” in a statement. “I look forward to carrying on our close partnership with you and to continue deepening it,” she said. European Council president Donald Tusk said his appointment came at a “crucial time” for Italy and the European Union — which is facing its own crisis with the departure of Britain. European Commission President Jean-Claude Juncker was more blunt — saying Italians need to work harder, be less corrupt and stop blaming the EU for the problems of the country’s poor south. In a sign of the direction of the new cabinet, Conte named hardline anti-migrant League leader Matteo Salvini as interior minister and eurosceptic Paola Savona — whose initial role as finance minister was vetoed by the president — as European affairs minister. Five Star leader Luigi Di Maio is minister for economic development and both he and Salvini will be deputy prime ministers. “We’ll get to work to create work, for those who don’t have it, for those that do but without dignity,” Di Maio said. Salvini has long wanted his new post, from where he will aim to stop “the business” of migration, cracking down on people smuggling networks and speed up expulsions of illegal immigrants in a country on the front line of Europe’s migrant crisis. “The people have voted for us to increase security and that’s what we’re going to do,” said Salvini, an ally of French far-right figurehead Marine Le Pen. Salvini said he would travel to Sicily on Sunday, where the majority of migrants arrive. 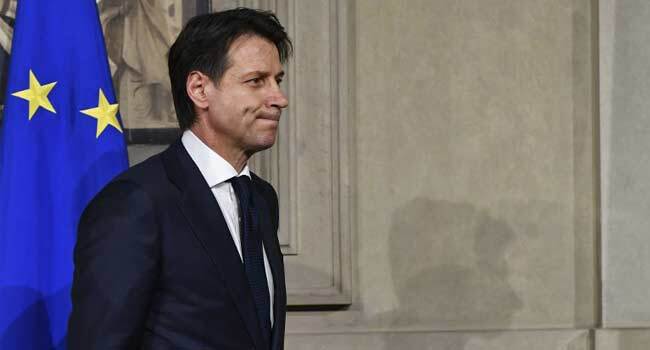 Just days ago fresh elections had seemed inevitable for Italy but on Thursday President Sergio Mattarella named Conte as prime minister for the second time in less than a fortnight and approved his revised cabinet. Mattarella had triggered a crisis at the weekend when he vetoed Savona as economy minister in a previously proposed Five Star-League government even though it had parliamentary approval. The two enraged parties abandoned their joint bid for power, and on Monday Mattarella asked ex-IMF economist Carlo Cottarelli to form a caretaker government. However, on Wednesday Di Maio, who had called for Mattarella’s impeachment over his rejection of Savona, offered an olive branch by proposing the controversial 81-year-old financier for another government post. That brought Salvini back to the negotiating table, and after frantic talks in Rome on Thursday the two parties emerged with a new 18-minister cabinet — only five of whom are women — that was quickly accepted by the president. Financial markets bounced back on Friday after a rollercoaster ride this week. The Milan stock exchange closed up 1.49 percent as hard hit banks showed signs of recovery. The spread, or difference in yield, between Italian and German 10-year government bonds, fell to 217 basis points after crossing the symbolic threshold of 300 basis points on Tuesday. However, the new government will have to square its reforms with its debt pile which represents 132 percent of its gross domestic product, more than double the EU’s 60-percent ceiling. Pictet Wealth Management economist Frederik Ducrozet that Italy was the only “highly indebted” euro nation not to embark on a structural reforms programme, while the European Central Bank tries to wean the eurozone off its massive monetary support.